Photo credits: Keith and Pat Davey. I had always imagined that jungles were tropical rainforests, filled with tall evergreen trees, dripping with moisture like you would find in the Amazon. But when Pat and I toured through the Indian jungles, I was in for quite a shock. 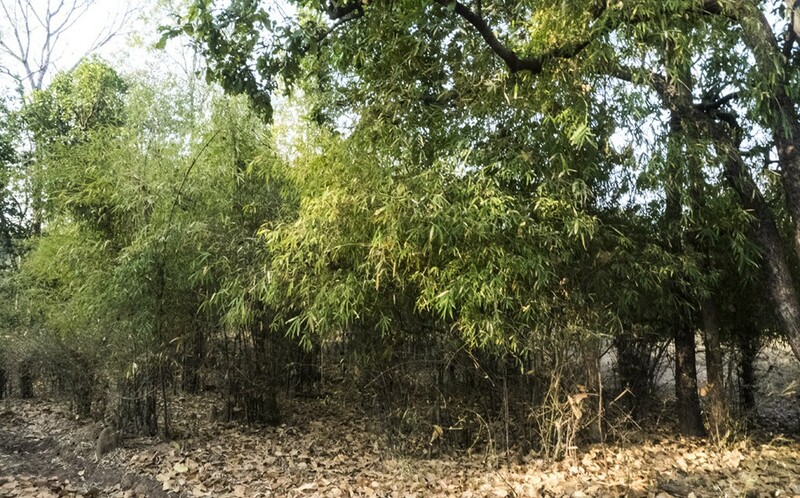 India’s jungles are more like open forests, mid-sized trees with broad leaves and bamboo thickets, behind which many Indian animals shelter for cover. Jungle descriptions include dry deciduous Sal forest or Teak and bamboo deciduous forest in the north-west and central India. 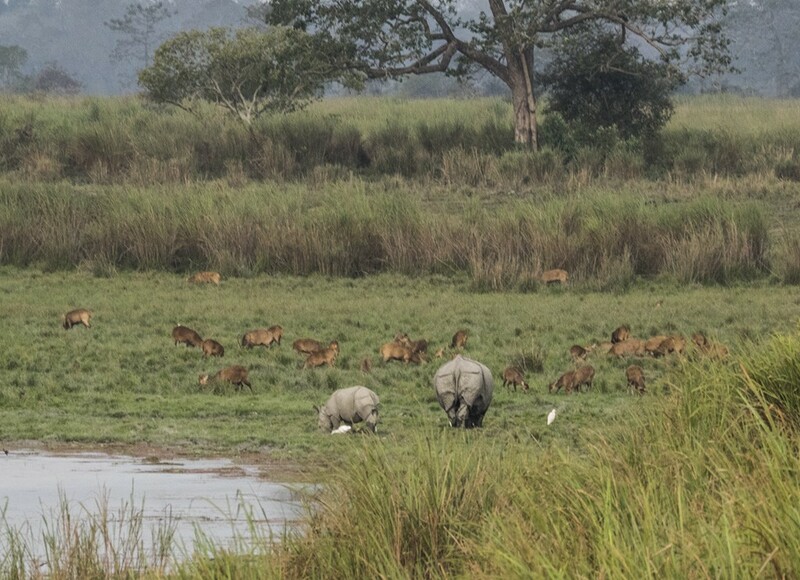 But in far north-eastern Assam, nestled under the Himalayas, there was a lot more water and this was reflected in the greater number of species and animal numbers than the more dry regions of north-western and central India. In mid-winter, the central national parks were much drier than I would have imagined, almost semi-arid in some western places. But it was the variety of Indian animals that was so impressive. 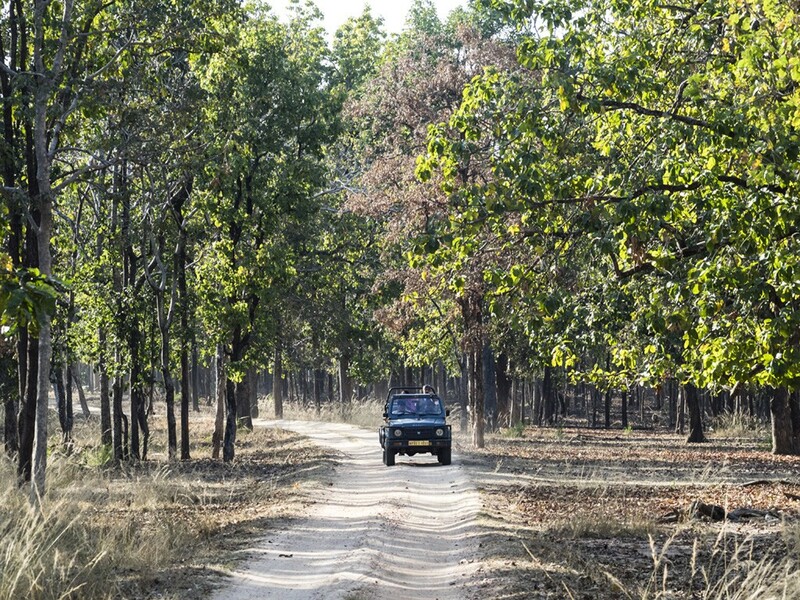 As we entered each National Park, we told each of the driver-naturalists that we weren’t only interested in seeing Tigers. 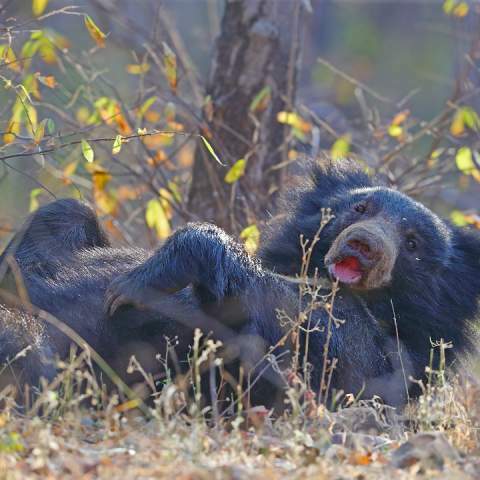 We wanted to see, observe and photograph all types of Indian wildlife, because every type was new to us. Some naturalists are just Tiger obsessed, so we had to keep telling them that Tigers were great, but we wanted to see everything else as well. Most driver naturalists were absolutely wonderful and really went out of their way to showcase what wonderful animals India is blessed with. (Reena: Government guides/naturalists in most parks are allocated on rotation to jeeps. We always appoint a driver/naturalist to accompany our clients and they are of a very good standard 🙂 Unfortunately Tiger crazy tourists have focussed heavily on tiger tracking, and this impacts the way government naturalists work. ). Well, that was until we saw our first Tiger. 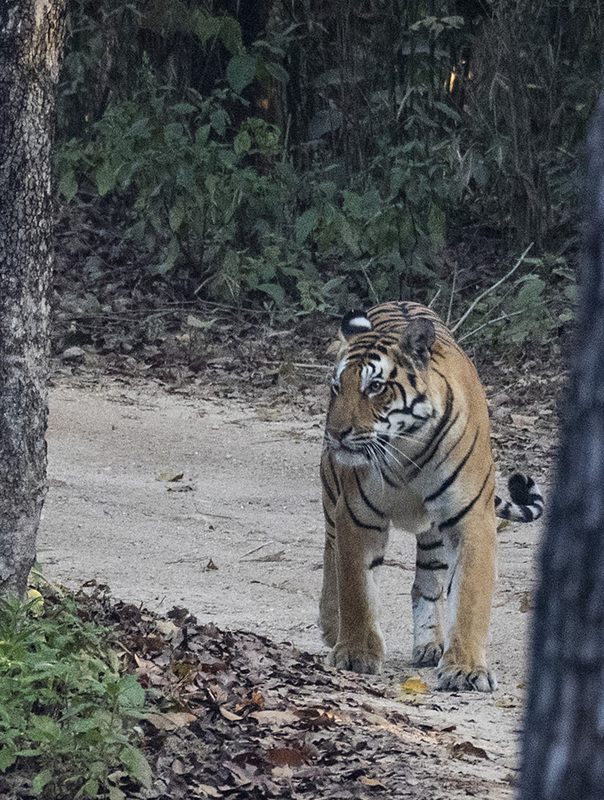 We had not been successful in seeing a Tiger in the first three national parks that we visited, so were starting to feel a bit downhearted that maybe Tigers weren’t that easy to see at all. 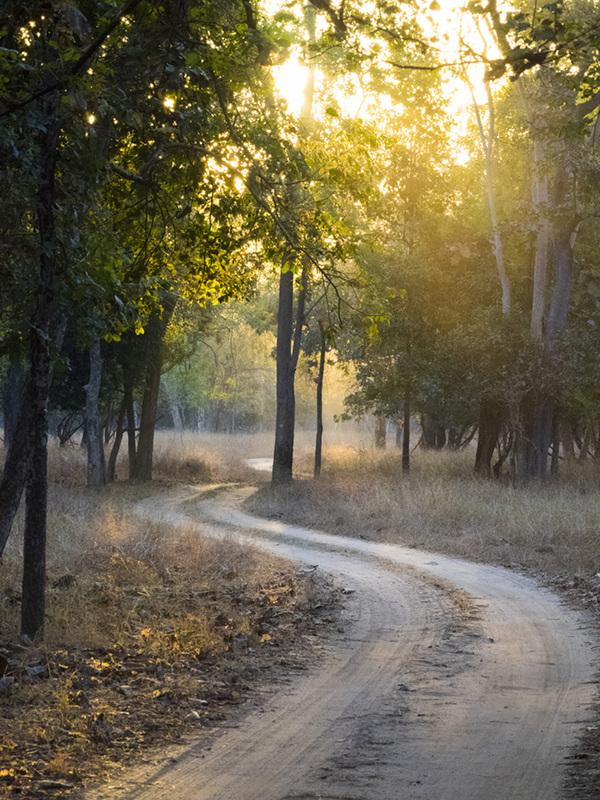 At Kanha National Park, early in the morning, as mists were swirling around low-lying area and the lakes and ponds, our driver came to a stop near a natural lake. “We’ll wait here for ten minutes’” he said. We were the only people there. 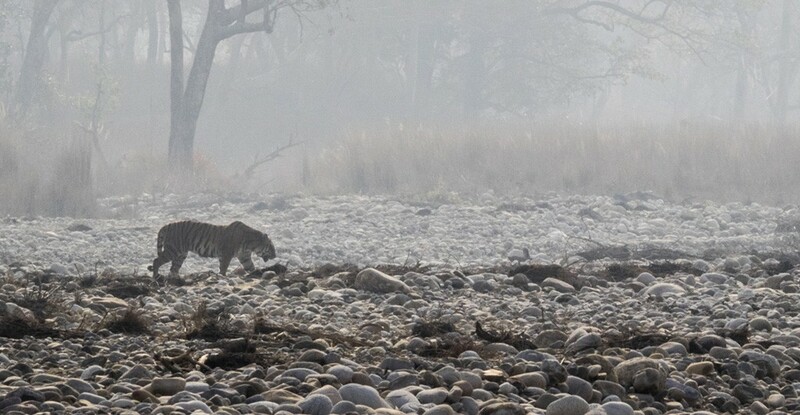 Right on ten minutes a magnificent male Tiger, Bheema broke from the foliage and strode along the bank, then down to the water for a very long drink. Our view was magnificent. Pat took video while I just kept taking photos. Half an hour later, just up the road about half-a-kilometre we were again blessed to see a female Tiger, Chotta Mata, or Little Mother walking towards where we had seen Bheema. Maybe she had something on her mind, since it was the Tiger mating season. 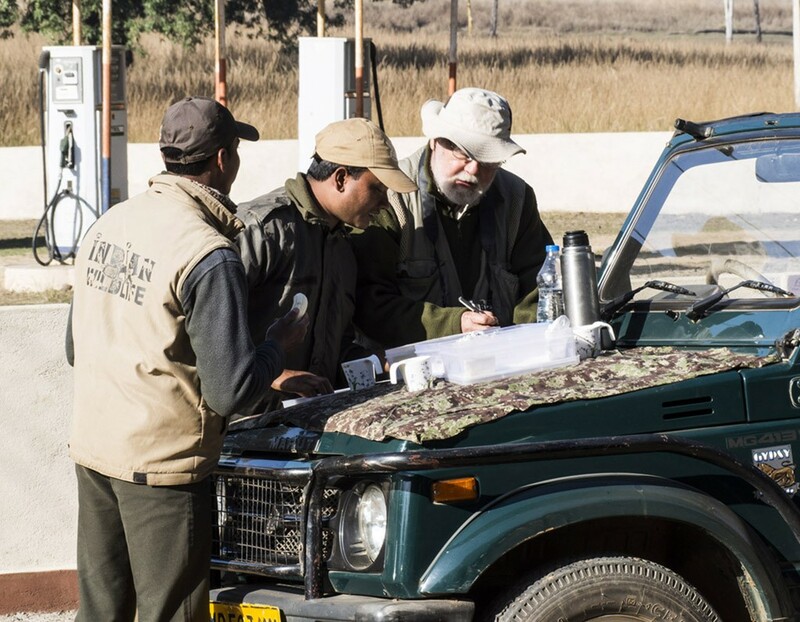 Pat and I were fortunate to be visiting Indian national parks at the same time as the parks and forest authorities were conducting the largest tiger survey held so far. 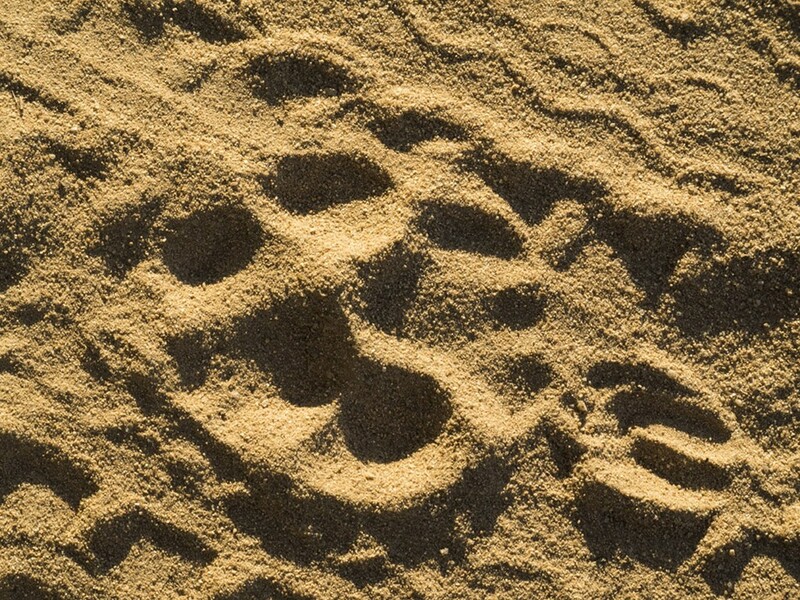 Forest rangers, national parks staff and researchers were in the forests counting pug (foot-print) marks, scats (droppings) and making camera and human sightings. Counters were on the backs of elephants, in jeeps, peddling on bicycles or on foot gathering the data. So far the data has not been fully analysed, but early findings point to an increase in the tiger population. 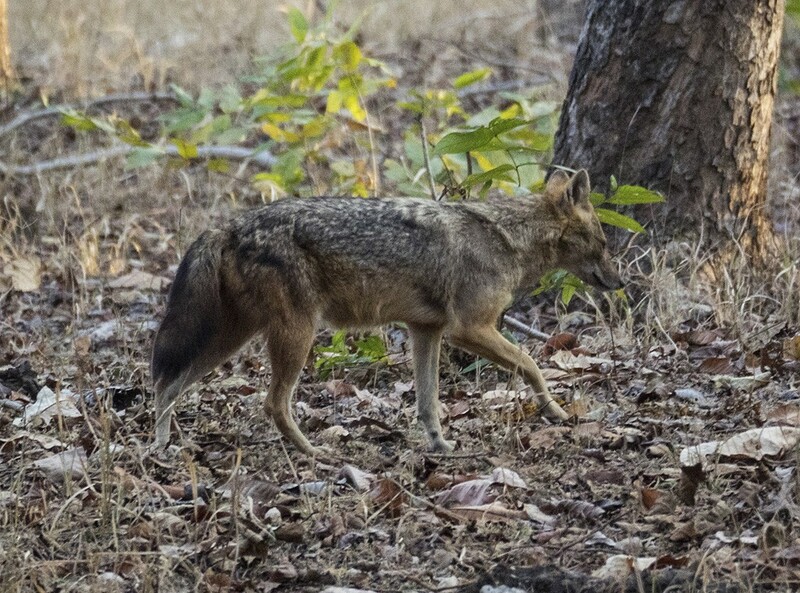 We only saw a fleeting glimpse of a Leopard once, but saw many Jackals sitting beside or running along the road before us. They weren’t worried by our presence at all. The most numerous mammals were the different types of Deer. 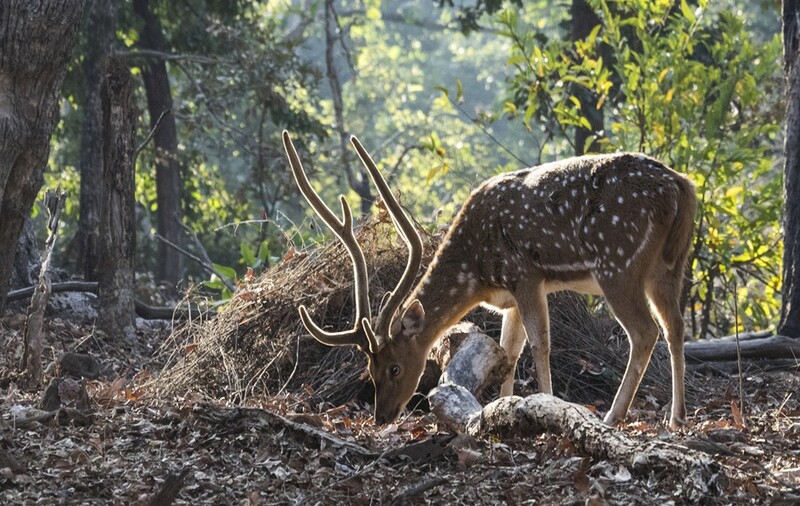 In western and central India the most common, to abundant deer were Chital (spotted deer). 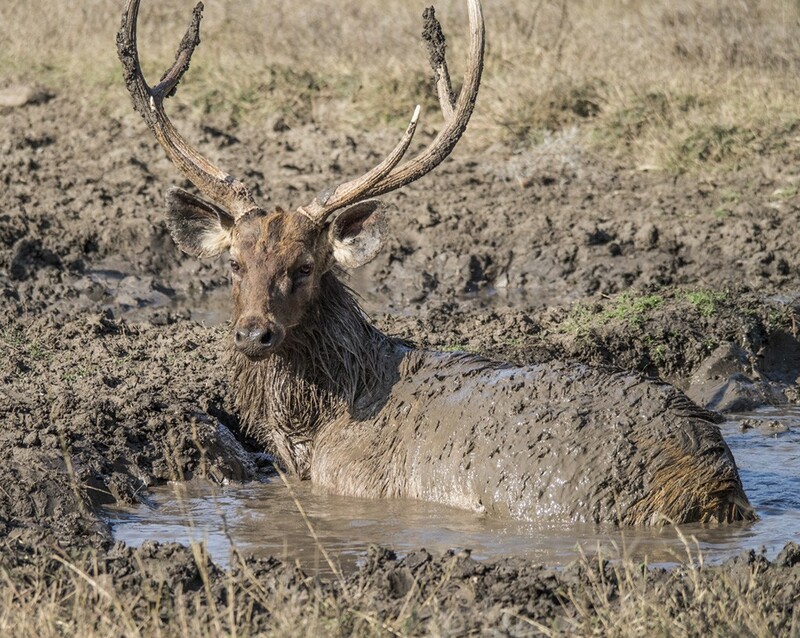 The second most abundant deer were the larger Sambar. They did not have the spotted markings. In north-eastern India the Hog Deer and Barking Deer were common. 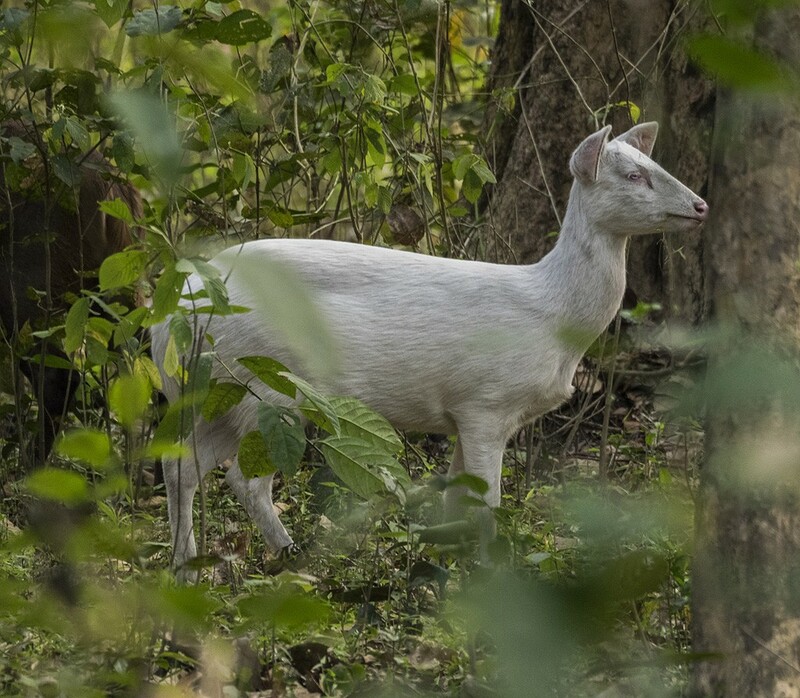 We saw a very rare albino Hog Deer that was fortunate to be able to survive in the wild. It’s poor sight would be helped by it living with others in a herd. 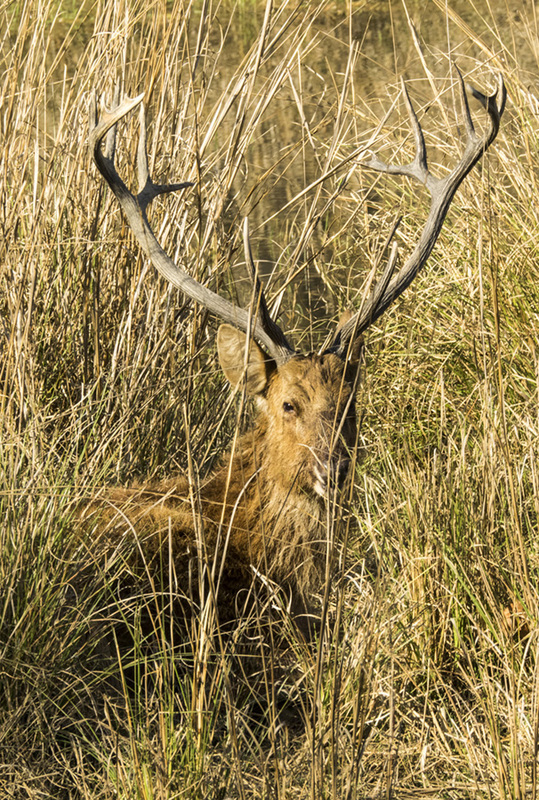 Barasingha, or Swamp Deer seemed common in moist places across India. Deer shed their antlers annually, while Antelope keep theirs. 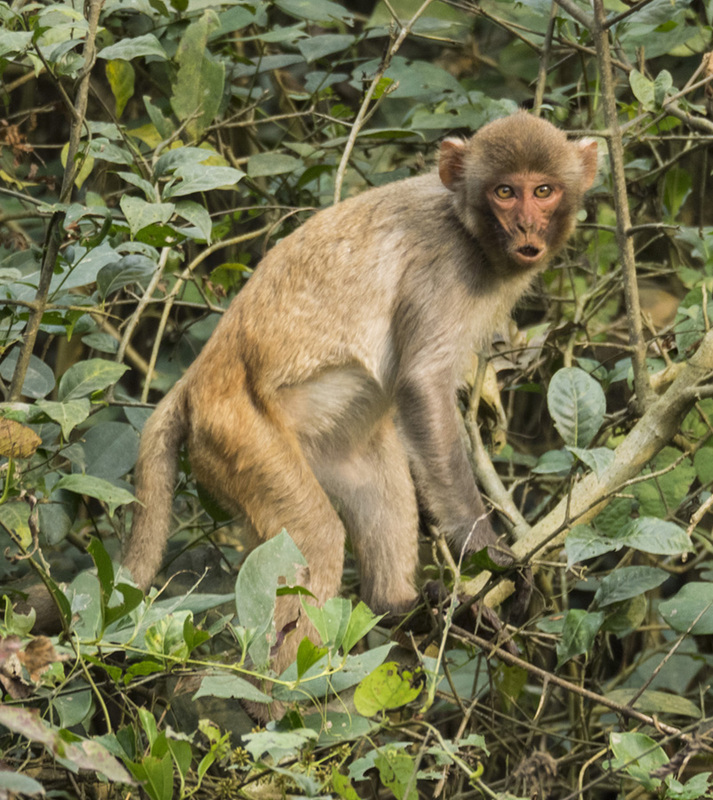 The most engaging animals were the monkeys. Their behaviours are so like ours, it is easy to have a real connection with them. 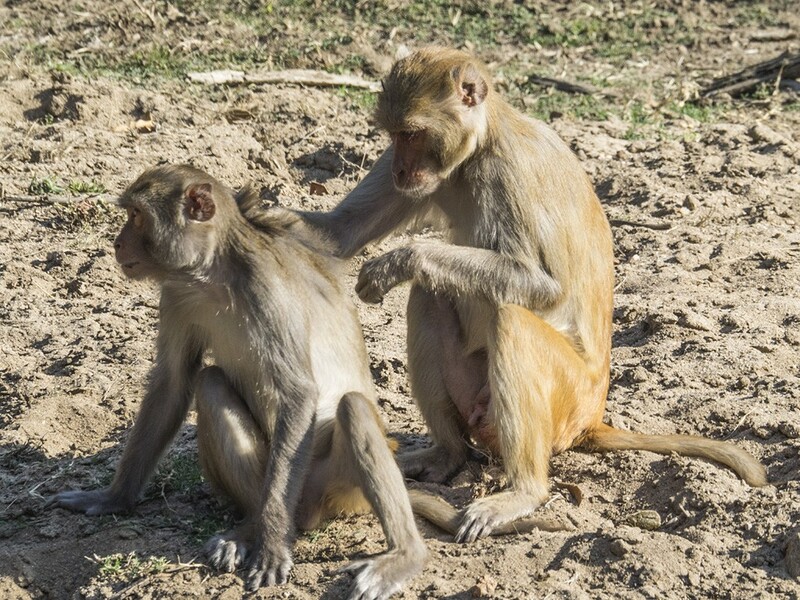 The nurturing of the young ones, and the grooming to remove ticks and other parasites was cute. The removal of ticks served more than just a social activity, as ticks can kill the host, so must be removed. 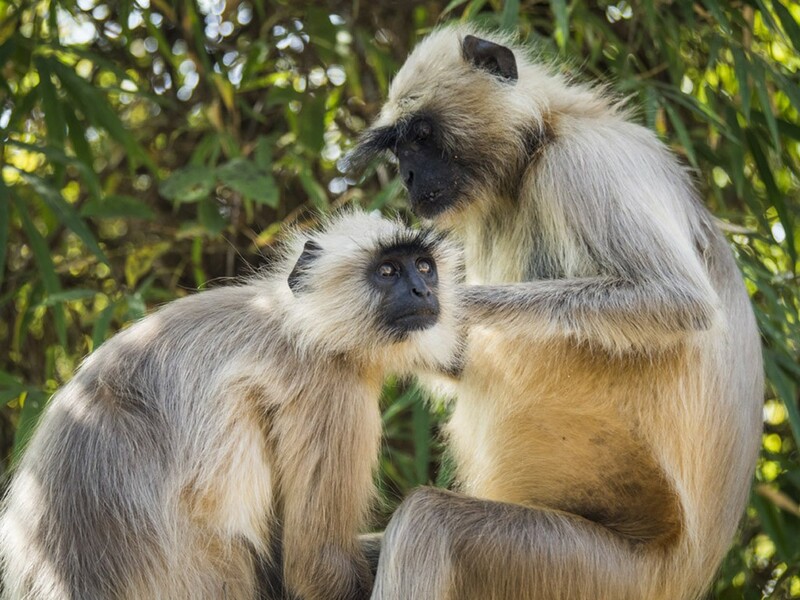 Black-faced Langurs and both Rhesus and Assam Macaques were all just so appealing. Another really cute animal is the Indian Otter. You just have to see one to instantly fall in love. Another large mammal was the not-so-cute Boar. We couldn’t tell them from the pigs that villagers kept as food. 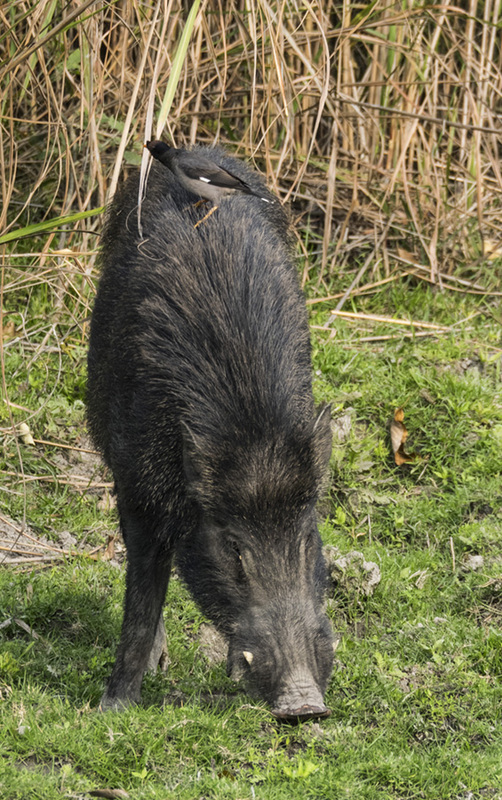 We saw plenty of Boars in all sorts of habitats, but they did seem to have a preference for wet places with lots of mud. 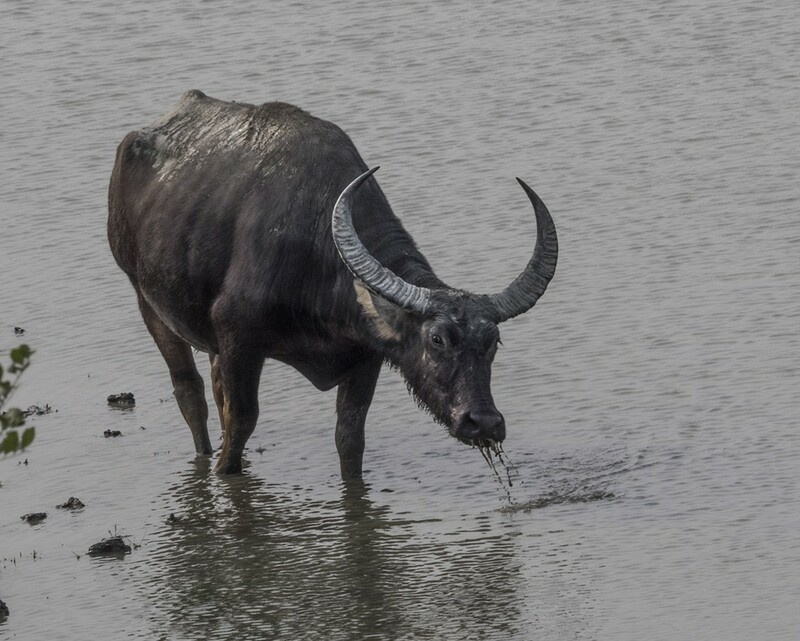 Another water lover is the Indian Buffalo, another animal that has been domesticated to help farmers plough their fields and cart goods hauling a rickety trailer behind them. 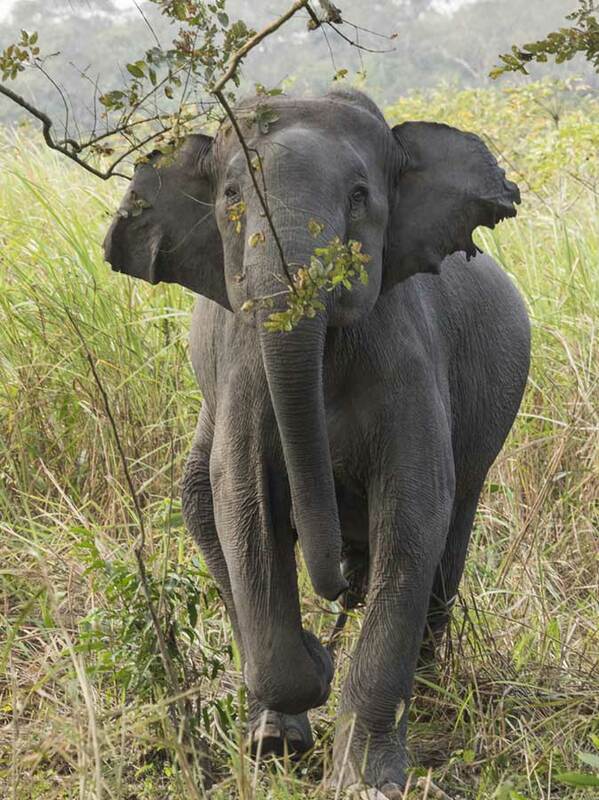 The largest mammal of the jungle has also been domesticated to help foresters to push and gather timber. It is the Indian or Asian Elephant. At Kazaranga national park we were chased by a young male, which was quite exciting and dangerous. 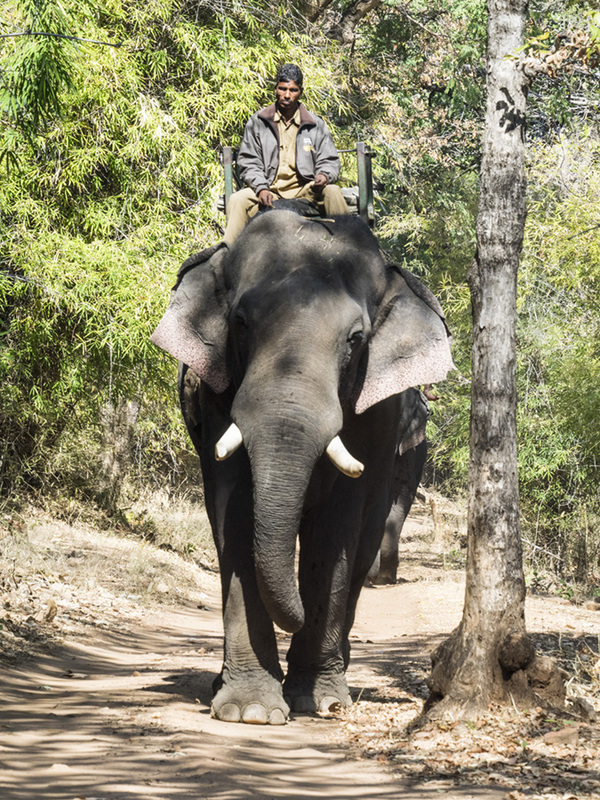 A Mahout master will look after an Elephant in a shared relationship for most of their lives. 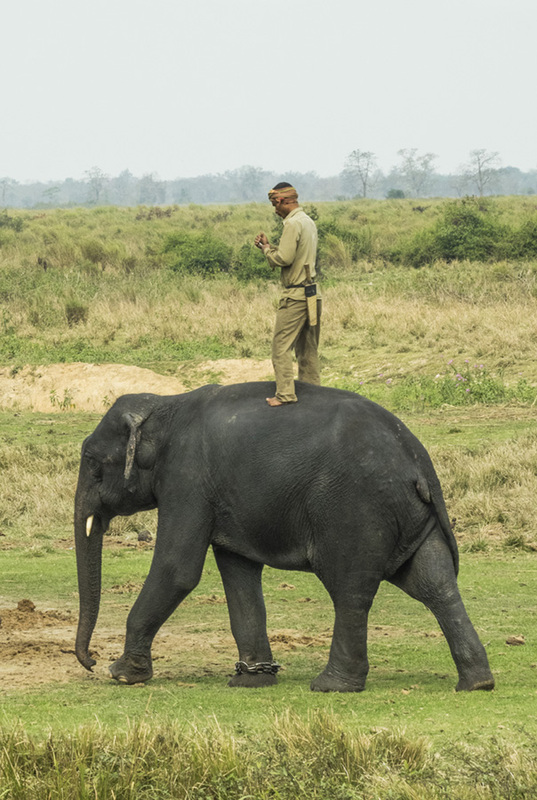 Here a mahout is trying to improve his mobile phone reception by standing on his elephant’s back. 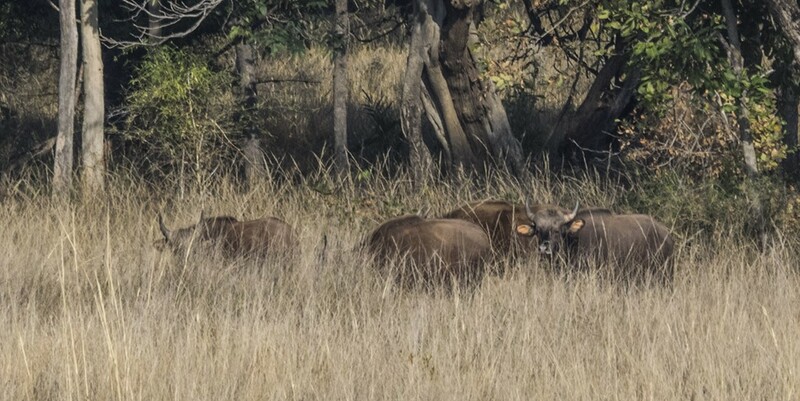 The most primitive wild cattle are the Gaur, and they are really bulky animals. You wouldn’t want to anger a Gaur. 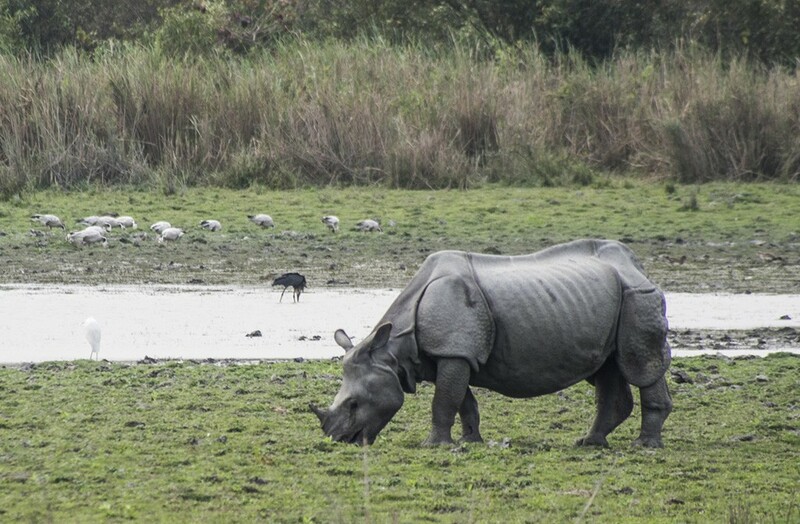 But the most amazing large mammal in India has to be the One-horned Indian Rhinoceros. It is found in North-East India, Northern India and Nepal. There are about approx 2,500 Rhinos left in the wild and half of them are protected in Kazaranga National Park. They are endangered because poachers kill them to cut off their horn and sell it to Chinese apothecaries for “traditional medicines” such as sexual enhancers. One killing occurred in early April 2016. I expected to see more snakes, but didn’t see any. I would have really loved to have seen a Cobra, but it wasn’t the right season, since they only emerge from shelter during the warmer months. 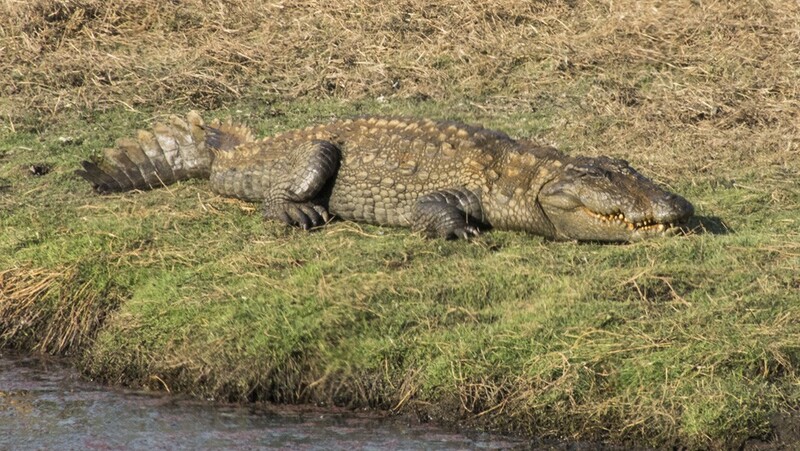 We did see a Mugger Crocodile, that is almost as large as a saltwater crocodile. 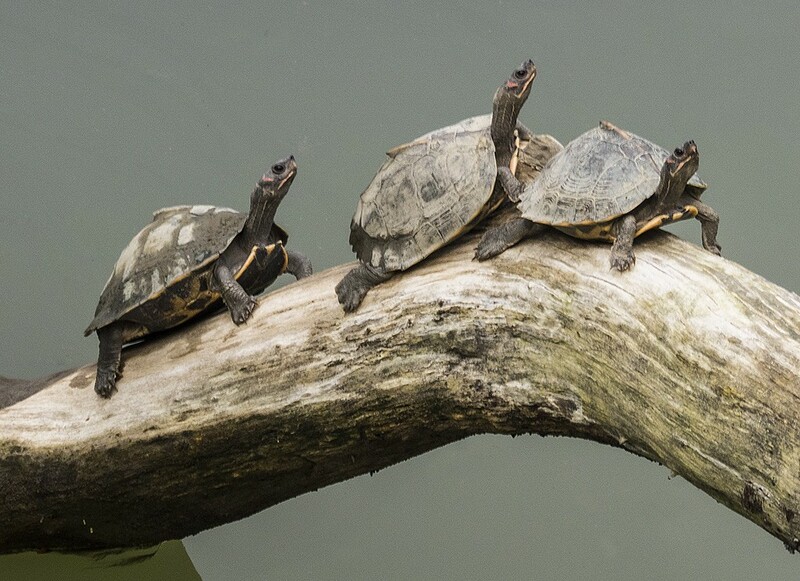 One cute reptile was the little Indian Roofed Turtle. They get this name from the little peaked shape on the rear of their shells. 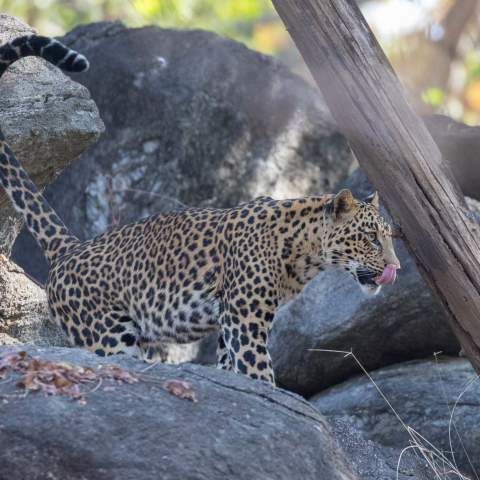 As a wildlife photographer and naturalist, it was just wonderful to see so many different varieties of animals in large National Parks where Indians now realise that their animals are unique and certainly worth caring for and protecting. 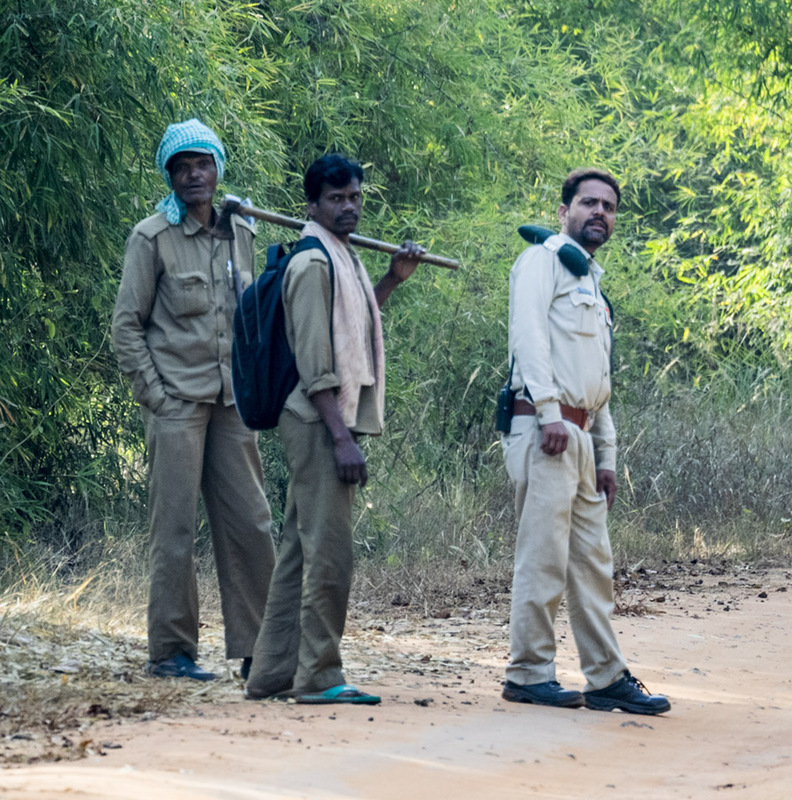 The enthusiasm and dedication of the ranger-naturalists, the forestry workers and the drivers to protecting their animals was truly heartening. 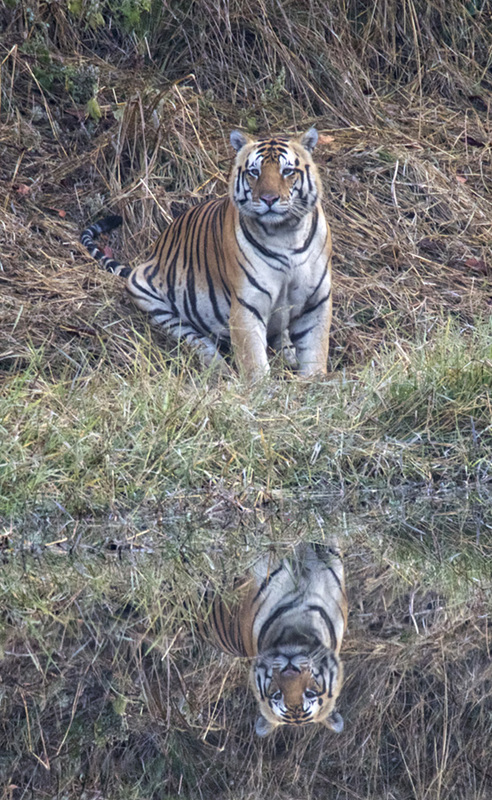 Both Pat and I really enjoyed visiting the great national parks in India to see the wonderful animals that live there. It was a life-changing experience. 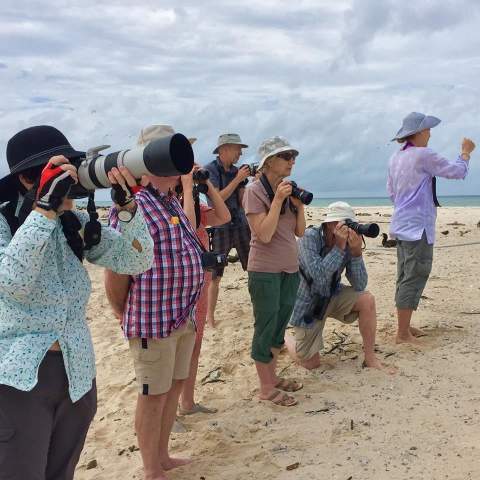 Keith and Pat Davey travelled on our Mantra Big 5 Private Tour in January/February, 2016. Contact us today for more information. 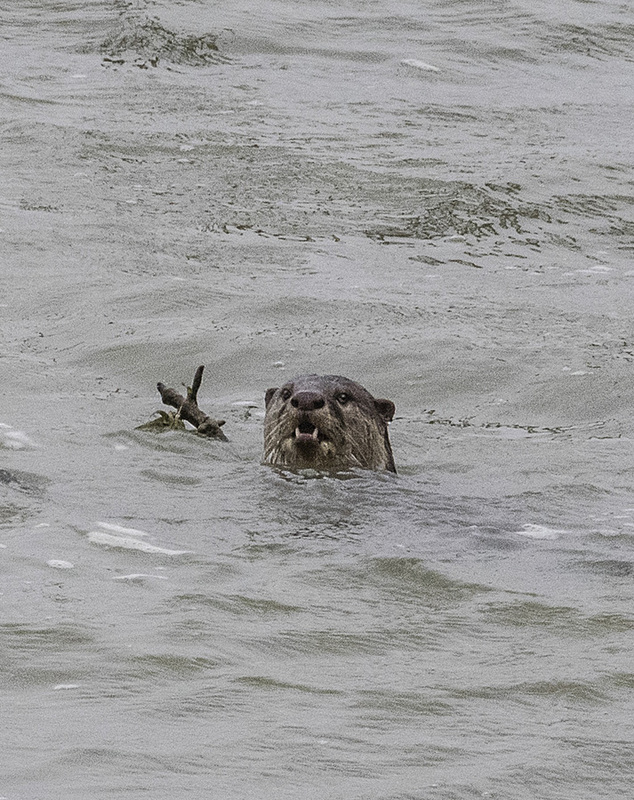 Interested in Wildlife Small Group Tours? 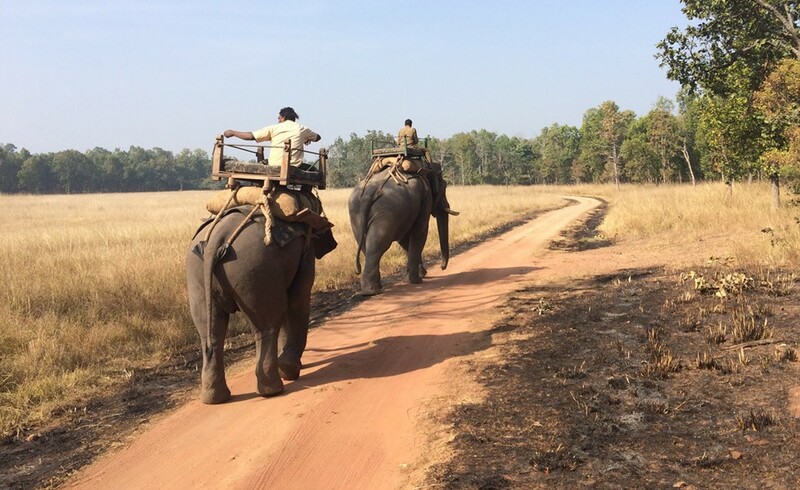 Have you been on an India Safari? Tell us about it in the comments below. What a wonderful experience that must have been. Even just looking at those photos transported me there and left me with a sense of wonder. Thank you.